Spot Mercury with a little help from the slim crescent moon on Thursday, June 21, 2012. As the moon makes its monthly journey around the Earth, it has regular close encounters with planets and stars along its path. Last week it passed close to Venus and Jupiter at dawn and next week it will pass by Saturn. But this week, it's Mercury's turn. On Thursday night (June 21) Mercury will be just to the right of a very thin crescent moon for observers in North America. Despite its brightness, Mercury is the least often observed of the classical planets. That's because it never strays very far from the sun, so must be spotted against a bright twilight sky. Having the moon as a pointer is a real boon for finding Mercury. It gives your eyes something to focus on, and narrows down the territory to search. Even so, binoculars can be a great help in spotting Mercury. Focus on the moon, low on the western horizon, and then sweep up to the right to spot Mercury. Take a close look at the moon, especially with binoculars or a telescope. To the left of the bright crescent you should see the rest of the moon shining faintly under the sunlight reflected back by the Earth. While you have your binoculars handy, see if you can spot the twin stars of Gemini, Pollux and Castor, just above and to the right of the Mercury. 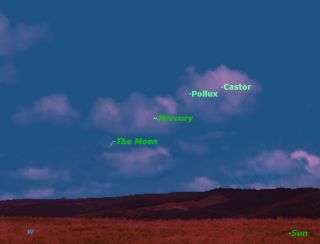 Observers in the southern hemisphere will have an easier time of spotting Mercury, because the ecliptic, the path of the sun, moon, and planets, is almost perpendicular to the horizon at this time of year. Look for Mercury just above the moon, and Pollux and Castor above Mercury.